Portions of the hoophouse have beautiful vegetables. 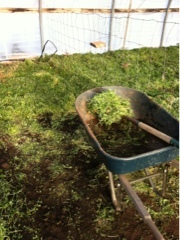 And other portions have weeds, the bane of any grower. 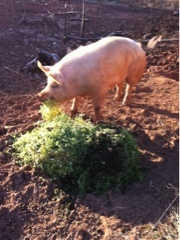 So this bright green, at this time of year, goes from being an annoyance to being pig food. 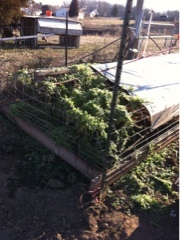 Pulled from the beds and walk ways, shoveled into a wheelbarrow, turned out to the pigs who love it. Cardboard and heavy paper will go down to slow this stuff up. It is the last section to be tamed...a few years ago the entire hoophouse was overgrown and unusable. Just this last section needs to get formed beds with wood frames and covered walkways. Everything is always time and money...and winter time pig food too!